Everyone loves a good heist movie. Everyone hates a Brett Ratner movie. So what happens when you put those two together? 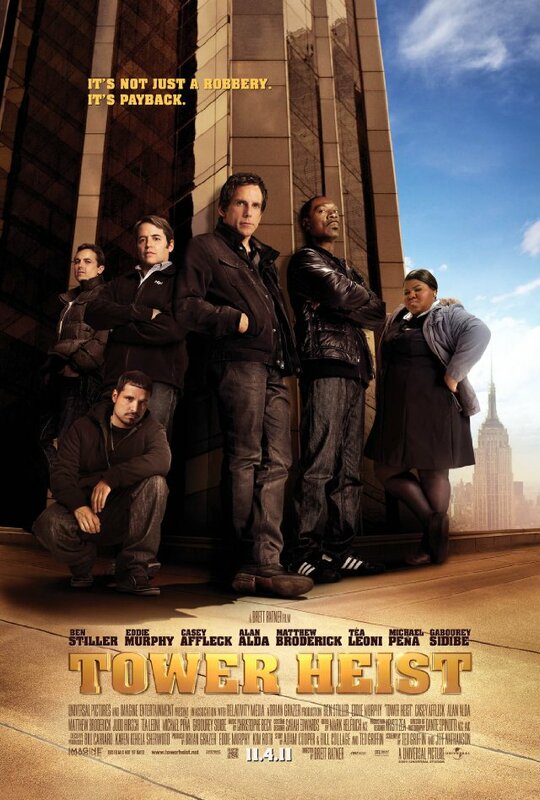 You get Tower Heist — a clever premise that could have been more successful if there were character arcs, a less predictable plot, more substantial dialogue for the talented cast, a less derivative director, and five minutes of fact checking. Ben Stiller steps out of the typical role of every Joe foiled and tormented by life and into the more straight role of Josh Kovacs, a methodical, by the book, but definitely caring manager of The Tower apartments in New York. His boss is building owner and ultra-rich Wall Street trader Arthur Shaw, played by Alan Alda. By the way, this is at least the third Shaw villian of 2011, partnered with Sebastian Shaw (Kevin Bacon) in X-Men:First Class and Reverend Shaw Moore (Dennis Quaid) in the remake of Footloose (which the original starred Kevin Bacon…Six Degrees of Kevin Bacon still holds true). Anyway, Kovacs is devoted to his boss, his employees, and his tenants. When Shaw is arrested for securities fraud, and it comes to light that part of that was investing the pensions of The Tower staff, Robin Hood Kovacs goes a little nuts and bashes in Shaw’s prized Ferrari with a golf club. After getting fired, Kovacs tries to go to FBI agent Claire Denham with possible inside information on Shaw to help them make the charges stick. She deflates him by saying the have all that, but as they drink together she puts into his head that Shaw must have his fallback money somewhere and they haven’t found it. This is where suspension of disbelief start to unravel, the sharing of privileged information. Anyway, Kovacs puts together the heist team of: Charlie, the undependable door guy. Juan, the previous Burger King employee that Kovacs had known for two days after hiring him as an elevator operator (in a modern building with buttons). Mr. Fitzhugh, who is an old, frail Matthew Broderick who used to be a Wall Street guy, and contributes nothing outside of calculating numbers quickly — which does nothing for anyone. Odessa, played by Gabourey Sidibe — I guess 19 awards and 15 nominations including an Oscar nom got her this fine role. She plays a Jamaican safecracker, who we only know is a safecracker because Kovacs remembers reading in her resume that her father was a locksmith in Jamaica. The information, was not presented beforehand, but as the discussion revolved around the team needing a safecracker. “Hey, I know one! And guess what audience? Surprise?! You would have never guessed! Because I didn’t tell you. HA HA!” And finally, Slide, played by a reasonably humorous Eddie Murphy. If this movie has been any good, it could have marked a comeback for Eddie after an impressive long string of failures. Slide, is a street thug, who Kovacs thinks can help them with a high-level heist because… a thief is a thief. And they had been in daycare together as children — again, something that we could have never known, despite opportunities to establish it. The fact is not really utilized in any capacity outside of a fleeting reference. And when they were in preschool, Kovacs had asthma and possibly epilepsy — a seed planted early on that never contributes to the story at all. I mean… what if at the height of the heist, when everything was on the line, that Kovac’s has an asthma attack? or worse an epileptic fit?! Wouldn’t that add tension and drama? No, instead we have a gag where a yappy dog might give them away. OK — so we’ve established a crack team of criminals. And to the films credit, it acknowledges that they are a bunch of misfits. But, what happens is that they suddenly turn from that into a clever crew of cat burglars, where their whole convoluted and implausible plan comes together. FBI agents are foiled. Slide traps the building manager in a closet with the old chair under the doorknob gag which I mythbusted when I was seven years old after seeing Fonzie do it on Happy Days. Odessa knocks an agent unconscious for at least 20 minutes by running a service cart into him. They somehow fake a court date for Shaw on Thanksgiving day to get him out of the apartment during the Macy’s day parade that happens to go right by The Tower. If they explained how they did that, I missed it. I must have blinked — or fallen asleep. Then when they get into the apartment, they find the hidden safe despite Slide trying to double cross them because – he is a thief. Odessa cracks the safe. Sidenote: A little gaff I think that shows her wiping cake from her mouth — this was cake that was drugged for the FBI agent whose clocked she cleaned with the tray because he was allergic to chocolate and wouldn’t eat the cake. I was expecting her to fall unconscious from eating the cake despite knowing it was spiked – thus adding to the tension. Who will open the safe NOW? Oh, Slide is the only one now because he learned from Odessa. We have to put our trust in him again despite his doublecross! But no, that potential plot twist wasn’t taken advantage of. So Kovacs opens the safe to find … that its empty. GASP! Arguments ensue. Kovacs and Slide fight over Slide’s gun, which accidentally fires — hitting the car, and DOUBLE GASP!! Not only is the money in the car. It IS the car. A CAR MADE OF GOLD!. This is the point where all story flaws previously in the movie can be dismissed as simply poor storytelling. Because, all other actions after this moment are now pointless. We have a CAR MADE OF GOLD. In Mr. Fitzhugh’s shining moment of worth to the team, he says (and I’m paraphrasing) “This car is about 2,000 lbs and at gold worth such and such per ounce, that comes to over $45 million dollars!” Wow. That’s a lot of money says the looks in the eyes of our veteran actors trying to act. If you haven’t caught on. The Ferrari would have weighed approximately 2,000 lbs…AS A CAR. Probably a bit more because its a vintage car and car parts were heavier back in those days. However. This is a CAR MADE OF GOLD. This car probably weighed, quite literally, TONS — with an “S”. Its unlikely the floor beneath it could have held it. So, our Robin Hood and Merry Men’s plan to get the car out of The Tower is to hook it to the window wash scaffold lift. IF they could have pushed the car, as soon as they started lifting with the scaffold lift, the lift would have ripped from the roof, the car would have pivoted through the window, fallen at thirty-two feet per second squared, 56 stories… becoming a missile that probably would have drilled through the patio, into the Manhattan bedrock and most likely destroyed a subway tunnel. And in the process, flattened itself into a silly putty like form because of how soft gold is. Now, while this would have been an AMAZING visual effects shot to have worked on, it would have been the end of the movie. It was the end of the movie for me regardless. Everything else that followed meant nothing. Every death-defying feat that this band of inexperienced everymen did required that the car weigh…as much as a car. Anyway…call me picky. I like my movies fantastical. I can go with Flubber, or that a man can put an ancient Danish mask on and become a cartoonlike character, or I can believe that Keanu Reeves knows Kung Fu. But, if you put me into a real world, that world better behave like reality. Wanna know how I know you didn’t pay attention to the movie? Alan Alda is just a tenant. Not Josh’s boss. The FBI agent didn’t share any privileged information. She just told him general information that any Joe Blow knows. Also, she was drunk, which sets up the loose lips in the first place. Charlie wasn’t the door man. He was the bellhop. Odessa had entire food cart. With the fat jokes given, one would assume she’d be the type to have some extra cake. You know, on her food cart. The car really did only weigh 2500lbs in real life. And vintage cars don’t weigh any more than modern cars, because modern cars are huge in comparison. Perhaps you should have spent more time watching the movie, instead of staring at your phone. While I do enjoy a good rebuttal, personal attacks are a pretty good indicator of a losing argument. So, next time you might leave those out. They weaken your stance and undermine your credibility. Just a helpful hint in social discourse. These mostly trivial oversights don’t change fact that its a poorly crafted story, and mostly unmemorable. The FBI and Odessa’s points indicate a lack of character development — an FBI agent wouldn’t talk about the case, drunk or not. Period. And, am I really supposed to believe that Odessa’s love of food would put the plan at risk? Shallow writing. And a lame method to push the story forward. SFX Tech #1: Wow, if this car were really made out of gold, this would never work. SFX Tech #2: Totally, we had to pull the engine out of this one to make it light enough to even get this shot. SFX Tech #1: Think we should tell em? My oversights don’t indicate a lack of paying attention to the movie. They indicate a lack in the movie providing adequate material worth paying attention to, and certainly not worth watching a second time for a fact-checking mission.